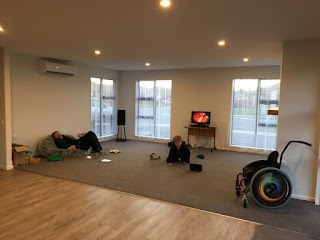 An Eventful Life: An Accessible Home - We've Moved In!! An Accessible Home - We've Moved In!! 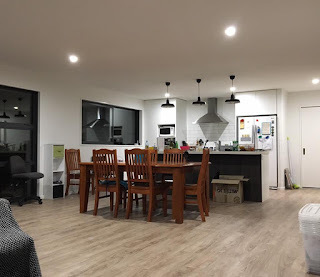 I realised somewhere along this journey that I forgot to update and really thanks to winter, selling our current house and the racing back and forth between the two properties I just had NO motivation to complete the blog! That was really remiss of me as many of you were following this progress with interest and hopefully to learn from our experience. To add to the fun it was school holidays, our house sale had fallen through so we had to get the house ready for open homing again, and I was sick with a bad cold! It was a bit of a hectic period in our lives. We had to hold off moving in so we could keep our current house open home friendly with furniture. So we moved camping gear to the new house and had a small amount of food/tea making facilities and started spending a few hours a day just hanging out at the new house getting used to the vibe. Then all in a rush my Sister and Brother in Law arrived, and the next day the movers were there and BANG! We moved into the new house. What was the final few months like in the build? 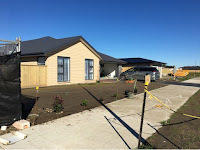 Thats what you all really want to know, as the house progressed it went all quiet and we couldn't really visit the house as it was constantly busy with tradespeople installing gib, painting walls, landscaping the section or generally busy within. In the final month I was onsite often to give information to the builders on where we wanted rails, the shower seat, the hooks for our sons indoor swings and lots more. In the last week we had the Occupational Therapist visit and look at the rails, ramp, deck and thresholds to ensure we had to all correct. Was it a drama? Yes, it WAS! Unfortunately as we neared the end a series of issues arose which threw us all. The major stumbling block? The front door, which was an aluminium prefabricated frame and door. 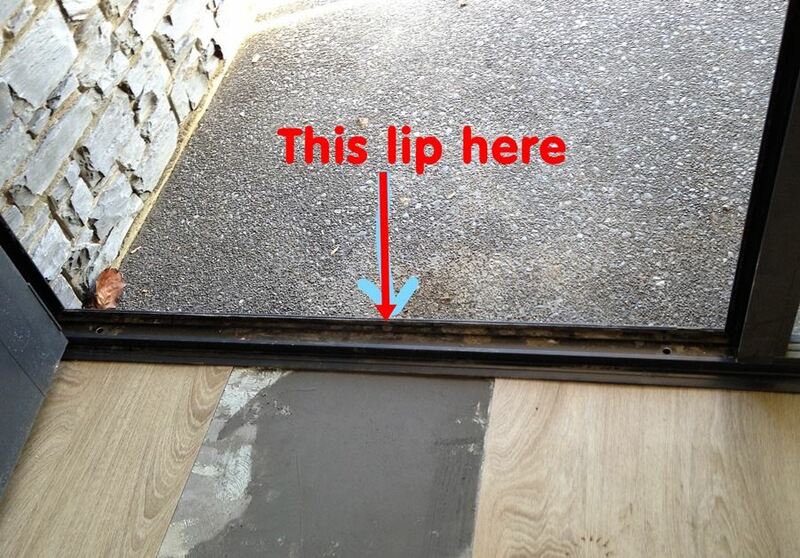 When we had the deck and ramp installer visit the site to discuss installation he pointed out the door and threshold weren't going to be level and his ramp wouldn't help. We were shocked! We just hadn't noticed that the frame of the front door wasn't level, we just assumed that our Building Company understood our needs and it was all in hand. This was late on a Friday when the house was all locked up and the Builders had gone home. So over the weekend we fretted, and on Monday I organised a meeting onsite with EVERYONE to go over the issues. 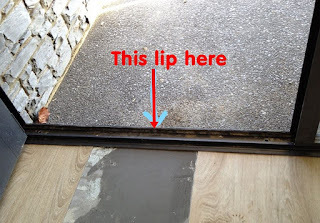 It was discovered that the decking contractor was right, the door frame did in fact have an uneven lip all the way around and we were never going to have a level entry. I got upset, I got angry, I wandered off for a wee cry. By the time I got back the husband had come up with an idea. He headed to the prefabricators in his lunchhour and had a long meeting with them where they designed a commercial door frame that would accommodate our front door and provide a level entry. The building company admitted their mistake and were willing to cover all the costs. The only issue? It set our move in date back by 3 weeks. In the end it was a big job to remove the old frame, chop out a large piece of the concrete slab at the front door so that it could be recessed more and allow a strip drain for the new door and any water to drain away. It took them the best part of two days to replace the door frame and rehang the door, then re-level the inner concrete floor and relay the vinyl planking at the doorway. But in the end we had a perfect level entry door which our son can easily roll in and out of! We've tested it quite a few times since then. What we discovered with the door fiasco was that what we considered to be level entry had a different meaning to the building company and builders in general. To them Level meant NO STEPS, or all on one level, it didn't mean flush, no edge/lip/frame that could stop a ball, wheel or whatever rolling from outside to inside without issues. They learnt what we meant, we realised we were innocently trusting people to understand our needs and they just didn't get it. We had to be really on top of it but we hadn't been. We should've resolved the problem months before but just hadn't spotted it. So we get that now, but it all worked out in the end and we're all happy. But do we love the place now? Its great having all the turning space, the huge bathroom with ease of access between our sons bedroom. Its been great to take him to the toilet, then into the bath, and then into his bedroom to get dried and dressed and into bed each evening. Having an internal access garage is great, the wide halls and doorways are fabulous and such a life changer! It took a good week to get used to the light switches being at 900mm high from the floor, which is the Lifemark standard for wheelchair users. Also the plugs all being at a higher level too. But our son has enjoyed having switches at HIS level. All the turning space and room in our main living area is great although we do have to get used to how big the space is and not to fill it up with stuff! Our son loves the place, he is very comfortable and enjoys moving about, checking things out. 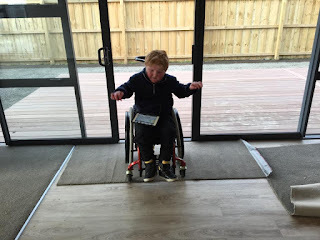 Just after we moved our son got a newer larger wheelchair and when that arrived we realised very quickly why we designed the place the way we did. It was obvious the place is made for future growth and is going to work admirably as he gets older. Yes, at the end of the build we got the Building Company to send in the final assessment with a few photos from us of the thresholds. After a bit of discussion from the assessors with my husband they were satisfied that our home met their highest rating and we were awarded the 5 Star Lifemark Certification. We even have the certificate to prove it. What does that mean? 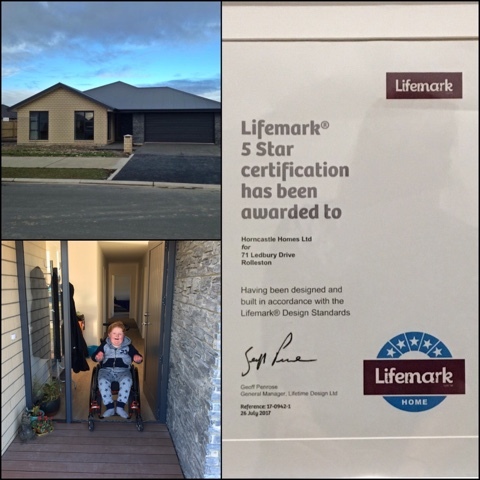 Well if you followed other blog posts about us deciding on the Lifemark process you'll know that we have proven our home meets the best standard for accessible and universal house design. We have hopefully got a place that will continue to work for those principals we were assessed for. Is there anything we could change? Well when we started this process our son was quite good at standing transfers and we were working hard to get him self transferring as well. One of the things we did and still do is help him into and out of the car. So he with help gets out of his wheelchair and we help him to lift into the car and sit down in his carseat. There is quite a bit of help needed, and lifting and adjusting, as well as picking up the wheelchair and putting it in the back of the car. Hes now 10 years old, so hes heavy, and tall, and its awkward, heavy and tiring work for anyone helping him. So we saw the Hospital Car Support team who assess his vehicle needs in the past year as well. The outcome? He really should be in a van with a hoist, and his new wheelchair accommodates that, it has places to add tie downs, and a chest harness for travelling in a vehicle. So we realised that the new house design didn't have a big enough garage with a high enough garage door to allow a high top van and a wheelchair hoist to be used inside. We groaned at that oversight, but really a year ago we didn't think that was even an option, perhaps that was silly of us, but its too late now. We think the van will just have to be parked in the drive and the hoist used there when we eventually get around to using it. Right now he still is helped to get into and out of the car in the garage with no problems. Another issue? its awkward to get out to the washing line, we either have to go out the front door, around the footpath, through the swing gate (no handle he can reach through and use), and then out to the line. 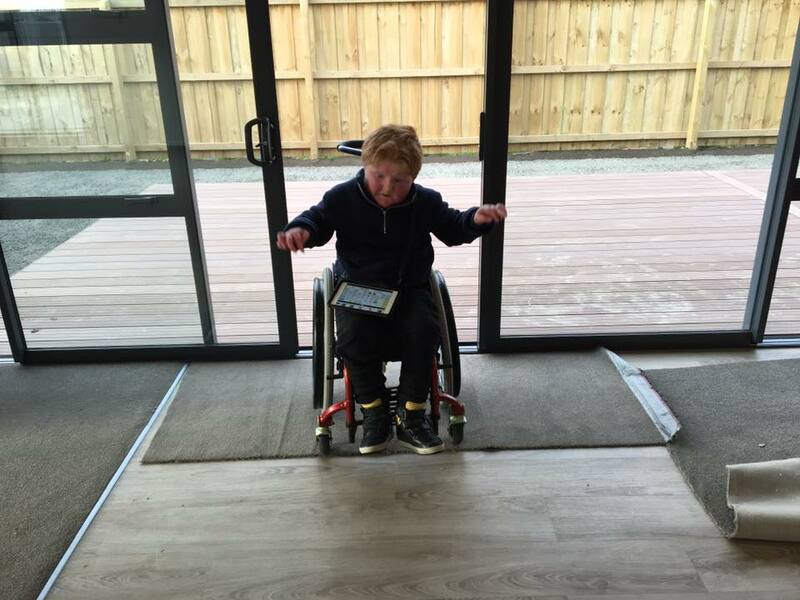 Or it off to his bedroom, pull open the sliding doors, and down the portable ramps we have there which are just a little too low (about 1-2cm?) and down to the line. Or from the garage where the laundry is, through a standard sized back door, put in a portable metal ramp, and off to the washing line. But there is also from garage, out to living area deck, down ramp by the master bedroom and along the grass to the washing line (right now thats inaccessible thanks to the weather turning the new grassy ground into a bog). 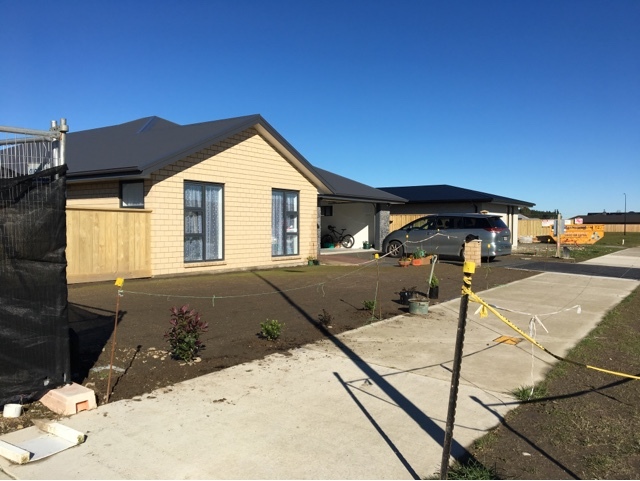 Then there is the letterbox, and the front door ramp...the footpath off the ramp ends in a 90 degree turn to the left and the letterbox, but there is grass around the letterbox and at the end of the footpath. So in order for him to get to the letterbox he has to trundle around an awkward (although wide) right angle, down onto the driveway and slide up to the letterbox but he needs to drop his front wheels onto grass in order to open the flap to see if letters are within. The letterbox really needs a handle otherwise he can't open it, it also needs a few concrete pavers to stop his wheelchair sinking into the soil! But those are minor and all in all the place we designed really well. 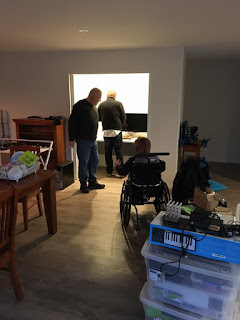 I am sure in time we'll think of other things we could've done differently, but right now we are happy to be living in a purpose built home that has at least taken some of the stress off living with a kid with a disability.